Read what other people are saying about Haley . . . The most astonishing young talent I have ever seen! “What’s the difference between a prodigy and genius?” The question came up a few times tonight. Heritage Fellow,, while attending a house concert given by Haley. Richardson is perhaps the finest young fiddler in Irish music today. A prodigious young talent (I reviewed her solo debut in this column a few years back), she plays the fiddle with an astonishing ability that seems well beyond her years. That she should branch out into production work is no surprise, but then again neither is the decision to produce a CD for charity. The first time I met Haley she was only five, I think. I was introduced to her by my friend, harpist Kathy DeAngelo. Kathy was her teacher and even though she had done a great job with her it was obvious that Haley was special. She was so comfortable with the instrument and really seemed to understand how the music was supposed to sound. It's no surprise she is still continuing to develop her playing every day- a natural player. Haley's playing is infused with an integrity that comes from disciplined hard work and unwavering focus on one simple goal: to play the music with a traditional Irish sound. If you weren't aware that Haley Richardson was still a young child of 12, the maturity of her fiddle playing would give nothing away. In fact, her superb grasp of the essence of Irish music and its vast canon of beautiful melodies has already produced great wonderment at her skills and comfort in both performance and competition. There is so much about this album that is so very, very good. Critically, Haley shows a masterful musical maturity in her tempos, and a deep understanding of the music. There are airs, jigs, fabulous reels, and barn dances. Each is played flawlessly, with great taste. Haley and Dylan have resisted the urge so ruinously common in much of Irish music to play everything at 375 miles per hour. No, these tempos are perfect, as they are meant to be in Irish music. It gives us room to hear style and ornamentation..If my math is correct, she was born in 2002. I’m stunned. I’m thrilled that the tradition is in such good hands. An incredible fiddle player with a wonderful new album Heart on a String....has such exquisite maturity on this fiddle, arrangements, and tastes, everything she does, the techniques....This young lady has a tremendous grasp of what she's doing on the fiddle...Oh, by the way, the fiddle player you are about to hear right now is 12 years old. The album is rife with interesting, high-level repertory (much of it common to players of the Sligo persuasion) and the Richardsons execute nicely throughout. Haley distinguishes herself in her playing, especially on “Porthole of the Kelp / …” (which has some flashy guitarwork from Dylan) “Bonnie Kate / …” (which features John Whelan) and ‘The Mathematician / …,” where her technical abilities are very much on display. Her well-realized version of “Lament for Staker Wallace” is another of the album’s highlights, as is her take on “Dear Irish Boy,” which features backing by Flynn Cohen. A lively approach to playing, her bow seems to dance across the strings as she tackles 14 sets of sometimes quite difficult music. She brings warmth to the melodies with her excellent intonation. I’ve never been especially keen on airs – not all musicians can really do them justice, but Richardson is one of those who does....Dylan is almost ever-present with his guitar. He has a strong sense of rhythm and is able to provide an inventive accompaniment throughout. They are significant because at the age of 12, Haley already displays a deep and innately felt understanding of this music. A constant companion throughout is the equally impressive guitar work of brother Dylan. ...on "Heart on a String" [Haley] already displays a command of the fiddle and a focus and lift to her playing that belies her age. It is often easy, and sometimes essential, to give some sort of leeway when assessing younger talent, but none is given or needed here, as Haley ranks right up there with the best. 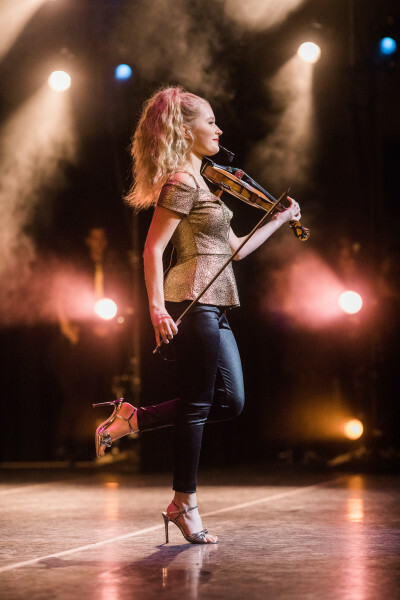 Listen to Haley's rendition of The Dear Irish Boy, however, and you will hear both a superb technical competence and a subtlety of playing which highlights the emotions of the tune. Haley is one to watch out for, as well as listen to. I predict a fantastic musical future for her, and would recommend this album unreservedly.